Jonathan McPhee is equally at home as a conductor for the symphony, ballet, and opera. 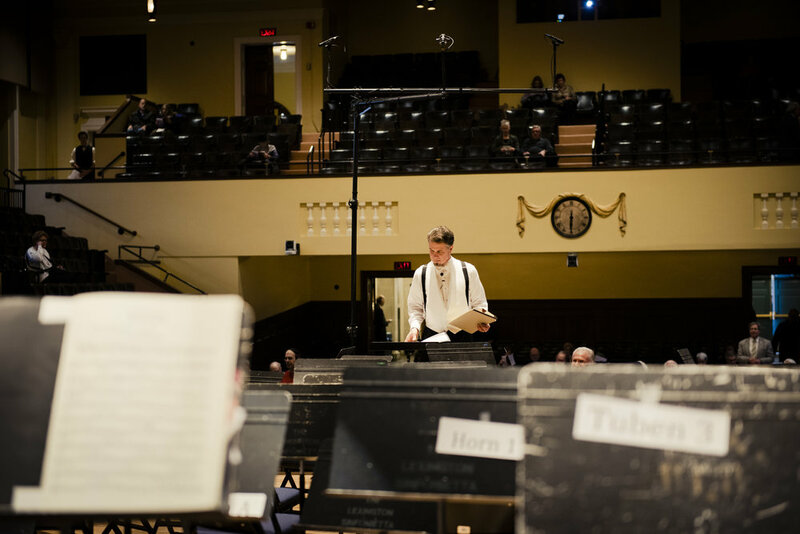 Having recently completed 28 years as Music Director for the Boston Ballet Orchestra and nearly a decade as Music Director of Symphony New Hampshire, Mr. McPhee maintains an active guest conducting in addition to his position with Lexington Symphony. In recent seasons McPhee has conducted many orchestras at home and abroad including London’sRoyal Philharmonic Orchestra, the National Arts Centre Orchestra in Ottawa, Canada, Sarasota Symphony (FL), andGermany’s Hamburg Philharmonic, and is a frequent guest conductor for Houston Ballet. Some of the world's most distinguished dance companies for which Mr. McPhee has served as conductor include The Royal Ballet (England), Martha Graham Dance Company, The Joffrey Ballet, National Ballet of Canada, The Australian Ballet, theNew York City Ballet, Houston Ballet, Den Norske Ballett in Norway, and The Royal Danish Ballet in Denmark. In addition to a broad repertoire in the field of dance, Mr. McPhee has conducted pops concerts, musical theatre and operetta. He has also conducted grand opera with Opera Boston, the American Opera Center in New York, and Boston University Opera Institute. Mr. McPhee was invited to conduct the Nashville Symphony as one of the conductors featured in the 2009 Bruno Walter National Conductor Preview by the League of American Orchestras. His collaboration with WCRB classical radio “Kids Classical Hour” earned a Gabriel Award in 1998. As Music Director for the Longwood Symphony Orchestra from 2005-2011, he garnered a Met-Life Award for Community Engagement in 2007 from the League of American Orchestras and the State of Massachusetts’ highest award in arts and culture, the Commonwealth Award in 2011. As Music Director for Lexington Symphony, his Young People’s Program “Orchestrating Kids Through Classics” won the 2010 Music Advocate Award presented by the Massachusetts Music Educators Association (MMEA) as well as a NEA Grant in 2013. Lexington Symphony and Maestro McPheealso received an 2012-2013 ASCAP Award for Adventurous Programming of Contemporary Music. McPhee preparing for a Lexington Symphony performance at Cary Hall. Mr. McPhee'sworks as an arranger and composer are in the repertoires of orchestras and ballet companies around the world. His edition of Stravinsky's Rite of Spring and the complete Firebird ballet are the only authorized reduced orchestrations of these works by the Stravinsky Trust. Mr. McPhee’s compositions and arrangements are published by Boosey & Hawkes, Inc. & Schott Music Publishers in Germany. His arrangement of Wagner’s complete RING Cycle entitled “The Essential RING”, was premiered by Lexington Symphony and has received international acclaim as a wonderful, and respectfully approachable version of this masterpiece from around the world. Mr. McPhee's best-selling recording of The Nutcracker with the Boston Ballet Orchestra has sold over 75,000 copies. He has also recorded Tchaikovsky’s Sleeping Beauty and Prokofiev's Romeo & Juliet with that orchestra (available on iTunes), and Michael Gandolfi’s Caution to the Wind on the CRI CD label. Mr. McPheeconducted the Danish Radio Symphony Orchestra and the Aarhus Orchestrafor the films of Martha Graham’s works telecast by DANCE IN AMERICA that included Samuel Barber’s Cave of the Heart, Gian Carlo Menotti’s Errand into the Maze, and Edgard Varese’ Integrales, Offrandes, and Octandre. Born in Philadelphia, Mr. McPhee received hisL.R.A.M. from the Royal Academy of Music and University of London, and a B.M. and M.M. from The Juilliard School. While at Juilliard, Mr. McPhee was the recipient of a Naumburg Scholarship in English Horn and Conducting. He has studied with Leonard Brain, David Diamond, Thomas Stacy, Rudolf Kempe, Sixten Ehrling, and participated in master classes with Sir Georg Solti and James Levine while at Juilliard.